1/5: The great state of Tennessee is home to a lot of great talent, mostly known for its music out of Nashville. Well, there is one certain young kid that comes out of Nashville that isn’t playing any sweet chin music. Chase Johnson, who is currently eleven years old and getting ready to turn twelve in just a couple months. He is a fierce competitor on the oval tracks out of Tennesee. Chase started out racing go carts at the very young age of five. Most kids that age are playing video games or out playing. However in this case, Chase grew up watching his father, Andy Johnson turn wrenches on his race cars and winning. When Chase began racing, he picked right up what his family was known to do, Win. 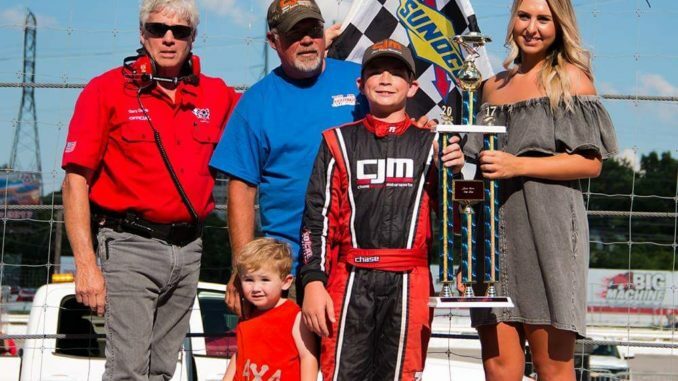 He started racing at the MCQMRA (Music City Quarter Midget Racing Association). Chase decided to move up the ranks a little. 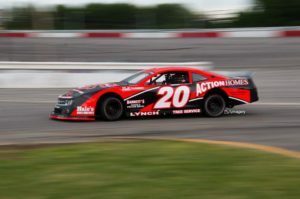 His team built a full size full bodied Pro-Mod 4 car and was set to compete at the famed Nashville Fairgrounds Speedway. Chase continued his great success as he set a record at Fairgrounds being the youngest winner ever in their 60 year history. He went on to win two races, and captured the Rookie Of The Year Award and merely missing the championship by just a few points. The 2018 season for CJM (Chase Johnson Motorsports) is growing, as they are preparing to move up the rankings once again. This year they will be traveling with the Southeast Super Truck Series. Chase will be competing in the #20 Chevrolet Silverado in the Southeast Super Trucks at several tracks in Tennesse, Virginia, North and South Carolina. Chase’s moto this year is to just get some valuable seat time, finish races, and earn the respect of some of the best short track veterans that compete in the series. He hopes to continue adding wins to his career resume.